Easy: Yesterday was a fine day but I didn't swim coz I had to bring Irene to Laco for a Cookfest. Apparently she was volunteered to represent Karen's class for a cookfest in celebration of Nutrition Month (July). How somebody concluded DH is a fantastic cook is anybody's guess. DH was tasked to cook pancit. 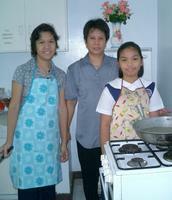 Not exactly her specialty but... Well that's them at the right with another parent who cooked spaghetti. The Home Economics kitchen at the school is rather spacious. They've got lots of utensils but only one gas stove worked. So the parents had to make do with sharing burners. After about an hour, the pancit is all done. The bilao and the banana leaf ensemble made it look really presentable. They had a couple of bilaos at the kitchen and someone cut banana leaves from the school's garden. There's the finished product at the right and that's Karen's adviser. Why so much? Well, the food will be shared with Karen's classmates of course. A dish was left for the judges and then there's the requisite portion for the faculty. Kainan na!!! 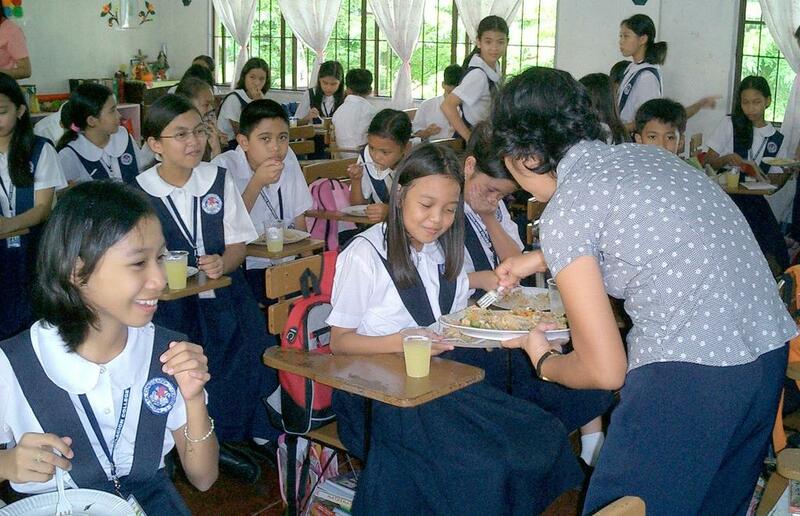 Finally, merienda time for the classmates at the classroom! Some classmates prepared juice drinks and the whole affair looked like a feeding program! Overall it was a fun activity. 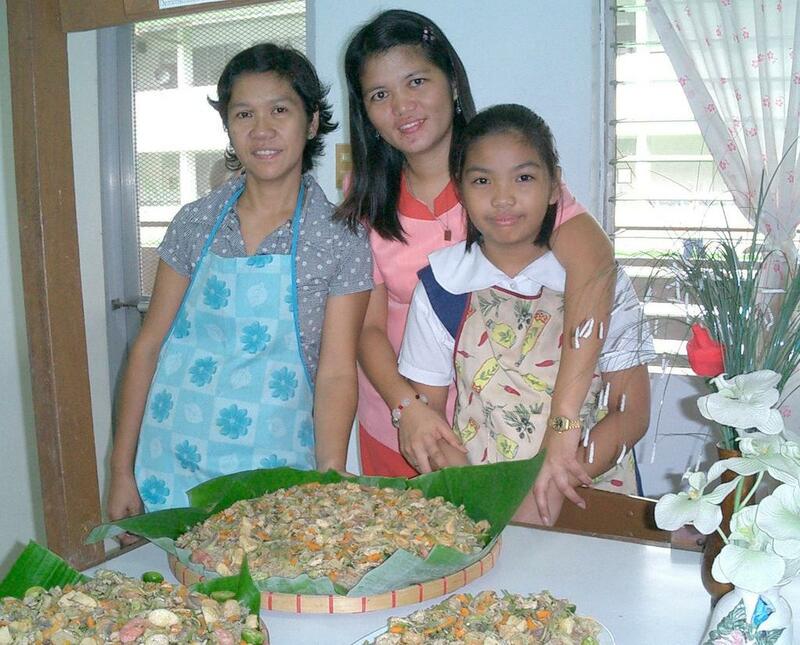 They said the pancit really tasted good! Of course it's good, DH cooked it! 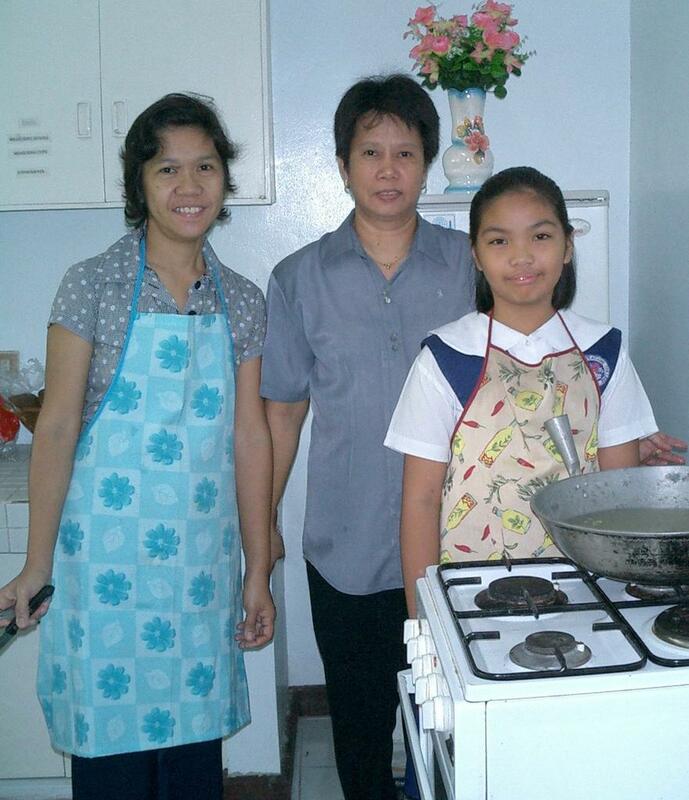 It was tiring, esp for Irene who slaved the previous night away to precook the ingredients. But seeing people enjoy the food made it all worthwhile and fun! Ahhhh... the sacrifices we parents make. There's this schmuck at the pool who always showers with the shower curtains open. Now I don't have problems with public showers but those stalls have curtains for a reason. He showers full blast in his underwear and gets the floor on the walkway all wet. And to think he works there. I could only assume that he hasn't outgrown his childhood fear of the "mumu" so he keeps the curtains open. Today was easy coz I'm still feeling the pain in the right knee. The funny thing is, I only feel it on the flutter kicks but not on breaststroke kicks. I have a feeling that the dolphin kicks this week triggered this. I could still do flutter kicks but I'd just have to use the thighs more and not stress the knee.